“Mercy is an important word for me, but in one way or another it is still somewhat condescending. I like to take words like respect and esteem for man as my starting point.” Archbishop Elect of Brussels Jozef De Kesel. In last week’s post Timshel encouraged us to “resist the urge to focus on the pope’s shortcomings during this time and stay focused on our own.” In that spirit, I fully disclose that as a younger man I made a habit of ignoring both dogma and discipline to feed my appetites. “Late have I loved thee, beauty so ancient and so new, late have I loved thee!” (St. Augustine, Confessions). So I hope it is without hubris when I ask, how did we get to this distressing point where so many people within the Church think that offering communion to people living in an objective state of adultery is mercy? Who rationalize away the plain meaning of the words “Whoever, therefore, eats the bread or drinks the cup of the Lord in an unworthy manner will be guilty of profaning the body and blood of the Lord” (1 Cor 11:27). Or how is it that an Archbishop Elect finds the very word mercy demeaning, as if the Divine Condescension never happened? I wish to explore how changes in the ideas of freedom and of law in recent centuries have helped to create the environment for these disturbing trends, where some people find a conflict between mercy and doctrine. I’ll plow ahead despite a miniscule knowledge of both philosophy and theology, as the evidence from our universities suggests the only thing more dangerous to reason and virtue than knowing a little philosophy is knowing a lot of it. My intent here is not to dismiss any pain and confusion suffered by the many people in irregular marriages, nor to overlook that they are all individuals in unique situations, not a lump of homogenized “sinners.” It is also true that much of what will be discussed here applies to sin in general and not just to this particular issue. I also recognize the need to soften my own hard heart and to show more mercy myself. However, since receipt of Holy Communion has lately been and will likely continue to be a particular point of contention, it is the issue that inspired this discussion, and without making some generalizations about people in this state who ask to receive communion it is difficult to advance any point of view. There is a modern misconception of freedom that is likely contributing to the acceptance of this Eucharistic heresy by some within the Church today. The classical view of ethics, detailed most completely in the Summa of St. Thomas Aquinas, is that true freedom is not morally neutral, nor isolated to individual acts. It is a freedom for something, specifically a freedom for excellence. 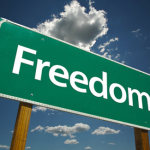 Our freedom is oriented toward an end of union with God. Growth in virtue is therefore indispensable to freedom, as we must be able, in accord with reason, to choose the greater good of our blessed end, our telos, over the often contrary inclinations of our passions. Sinful acts are therefore not examples of freedom, but actions that actually diminish our freedom – in the words of the Lord “everyone who commits sin is a slave to sin” (Jn 8:34). Our freedom increases as we develop ever better habits of virtue, enabling us to more and more effortlessly choose the good of our telos over all lesser goods. This is similar to the way in which a dedicated musician, after thousands of hours of practice, has achieved more freedom to play music than a beginner who can only bang out a few notes. The modern view of freedom, on the other hand, is descended from an idea that can be called freedom of indifference, promoted by William of Ockham in the 14th century. In this view, freedom is a pure act of will, antecedent to reason. Freedom must always be able to choose either good or evil if it is to be authentic freedom. It is “freedom of indifference” because it is indifferent to the actual choice that is made, freedom simply lies in the ability to choose. Anything that influences this pure act of will toward good and away from evil (such as reason and virtue) is therefore a constraint on freedom. Unlike freedom for excellence, in this understanding there are no gradations to freedom, and no relationship between past acts and future acts. Man is either free or not free, and each act stands alone, isolated in time from the rest of one’s life. It seems a common sense question to ask why if freedom is indifferent to evil it should even be considered desirable. However, its desirability seems to have been taken as a given regardless of its definition. One problem with freedom of indifference is that by defining freedom as the ability to choose between contraries, that necessarily includes God’s freedom. For God to be free, He also must be able to choose between contraries. This implies that God’s free acts do not stem from who He is, but from mere acts of His will (which seems to me a very Islamic view of God). Therefore, the laws and precepts He gives us are necessarily arbitrary. We should love Him and our neighbor not because in the order of reality it is just to do so, not because His law is for our good, but merely because He told us to. In fact, Ockham posited that because of His freedom God could in the future order us to hate Him and our neighbor, at which point it would be moral to hate God and immoral to love him. The understanding of living a good moral life, therefore, began to devolve from a lifelong enterprise of personal growth based on choosing the true and the good, to merely following a set of obligations defined by God. One of the critical connections lost in this philosophical change to a morality of obligation is that all law and rules are based on some kind of relationship. God’s commands are indeed arbitrary if they are not understood within the context of a loving Father acting within a rational creation. “For I will only your well-being, and whatever I give, I give it so that you may reach the goal for which I created you” (St. Catherine of Siena, The Dialogue). This is one of the great challenges to the Church in modernity, where the word “commandments” has a negative connotation because the very idea of rules is divorced from its necessary relationship to an infinitely loving God. However, as much as modernity has worked to aggravate this problem, it is not a new one. If we look carefully at the Biblical language, we see the split between relationship and law in the very first sin in the Garden. The Hebrew Scriptures use two different expressions for God. The word Elohim is used for God as Creator, as Lord of the material world, as the ruler of nature and the source of life. In contrast, when the Scriptures wish to present the personal character of God and his relationship with humanity, the term Yahweh Elohim is used, using the divine name revealed to Moses. This expression is translated as the LORD God in both the RSV and New American Bibles. The first three chapters of Genesis use both of these expressions for God. In the first chapter, the word Elohim is used, translated simply as God. This is appropriate for a text which focuses on God as Creator of the universe. In Genesis 2, however, an important change in language takes place. God is no longer described simply as Elohim, but as Yahweh Elohim. Thus as God makes Adam, interacts with him, and ultimately creates Eve, we are intended to see an intimate relationship on display. He is no longer simply God, but the LORD God. It is critical to recognize this relationship to make sense of the one prohibition that God sets for Adam. “And the LORD God commanded the man, ‘You may freely eat of every tree of the garden; but of the tree of the knowledge of good and evil you shall not eat….’” We are intended to see in this command a rule promulgated by a loving Father for the ultimate good of His children, who in retrospect obviously needed it. So how does Satan pervert this understanding? He influences Eve’s passions to override her reason, and thus her will. In Genesis 3, the language Satan uses with Eve is not Yahweh Elohim, the personal God, but simply Elohim. “Did God [Elohim] say ‘You shall not eat of any tree of the garden’?” In other words, did God, not loving Father, but distant creator, remote lawgiver, order you not to do this? Satan attacked her relationship with God to make His command seem unreasonable. Eve’s response tells us just how totally she bought this lie when she responds that not only did God forbid them from eating it, but also that “…neither shall you touch it, lest you die.” Of course, God had never said they could not touch it, but her passions were already clouding her reason; she no longer saw God’s command as a reasonable one proceeding from a loving Father, which is why she exaggerated its proscriptions. When divine law is divorced from relationship with God, it is easy to lose sight of the fact that the law is based on an underlying reality of what is necessary for our ultimate happiness. Without the lifelong practice of developing the virtues, our passions can always present law to our reason as, if not simply arbitrary and capricious, at least something to be rationalized away. It may not be overstating the case to say that communion for the civilly divorced and remarried falls into a kind of theology of utility. I say this with no intent to judge anyone’s heart, as “nothing in the world can make it right for you to sit in judgment on the intentions of my servants, either generally or in particular, whether you find them well or ill disposed” (St. Catherine, The Dialogue). Yet it seems that this idea of utility may at least sometimes apply. A person feels pain for their situation and for being restricted from the Eucharist. How much of the pain comes from a true yearning for union with the divine and how much from desire to be accepted by the earthly community likely varies from case to case. Yet in their desire to end the pain and feel the pleasure of perceived communion, they do not accept that the “rules” of Eucharistic communion flow from the reality of God’s nature, the nature of sacramental marriage, and what it means for man to be divinized. Communion is therefore “utility” for them. They rationalize rejecting rules that seem to smack of arbitrary obligation, which they don’t understand flow from our relation to God as our Father. Like Eve, they come to see God’s rules as a constraint on human happiness instead of the basis for it. Perhaps they do want a relationship with God, but for some it is as children to a Father in His dotage, whom they may love in their way but who no longer calls the shots for them. They want to change a “rule” they see as discriminatory, but do not understand that what they are seeking is actually a kind of spiritual violence within their family, usurping the rightful role of the Father as head. In the story of the prodigal son, it is true that the father ran out to meet his son, but that was after the man renounced his lifestyle and made the humbling and difficult journey home. He did not simply write a letter to his father apologizing and asking for him to send money. Paragraph 1829 of the Catechism says that mercy is one of the fruits of charity, but it also says that “charity demands beneficence and fraternal correction.” How can we give fraternal correction to people living in adultery when we are doing the sacramental equivalent of sending them more money? The truth is that God wants us to show mercy, but mercy is not something separate from love, but an application of love toward the sinner. And as St. Teresa Benedicta of the Cross stated so clearly, “Do not accept anything as love which lacks truth.” That is why the God of mercy also tells us that if we “…do not speak to warn the wicked to turn from his way, that wicked man shall die in his iniquity, but his blood I will require at your hand” (Ez 33:8). God has shown great mercy to me, but my spiritual hemorrhaging did not stop by having the Magisterium rationalize away God’s rules to provide me with faux mercy. That would have merely given spiritual cover for following my own will. I came to conversion and thus to some degree of freedom only by coming to trust in God and his Church, which made the rules something I would eventually accept, and only finally come to understand. A failed marriage is a great tragedy, and we do need to comfort those who are divorced, separated, and in irregular marriages. However, just as the understanding of freedom and law has changed, so has the implied meaning of the word comforter. Today we think of a comforter as someone who sympathizes with another’s sufferings, who in effect says “There, there, isn’t it awful.” That is not what comforter originally meant, however. It comes from the Latin confortare, which means “to be strong with,” that is, to help another person be strong or brave. We need to comfort people by helping them to be strong, to help them to see God’s intended end of beatitude for them and to then have the courage and perseverance to act toward it. Applying love in truth without judgment, that is mercy. And when the Day of the Lord comes, mercy will cease, but love and truth will remain. Nicely done, Didymus. The balance between communicating the absolute Truth of the Church via “fraternal correction,” and what some would call a more “pastoral” approach is difficult to navigate. As you and others have pointed out, it requires a combination of courage and a trusted evangelization based on a personal relationship. As Timshel has correctly challenged us to examine the plank in our own eye in a spirit of charity, so you have added the equally important precaution to not dilute or avoid the Truth. Thanks for this addition to our discernment. Of Wine, Windmills and . . . Nuclear Power?